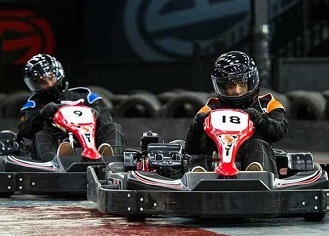 For go karting near the centre of Reading look no further. Located just off the main A33 Reading approach road this is a great spot for some high speed action. The circuit itself is a multi-level venue with petrol powered karts to give you the full karting experience. Excellent facilities and a well run outfit. At the traffic light junction turn off on to Rose Kiln Lane, at the first roundabout take the 1st exit onto Boulton Road, turn left again after 400ft to continue on Boulton Road, at the next junction turn left again onto Cradock Road, the circuit is at the end of Cradock Road.